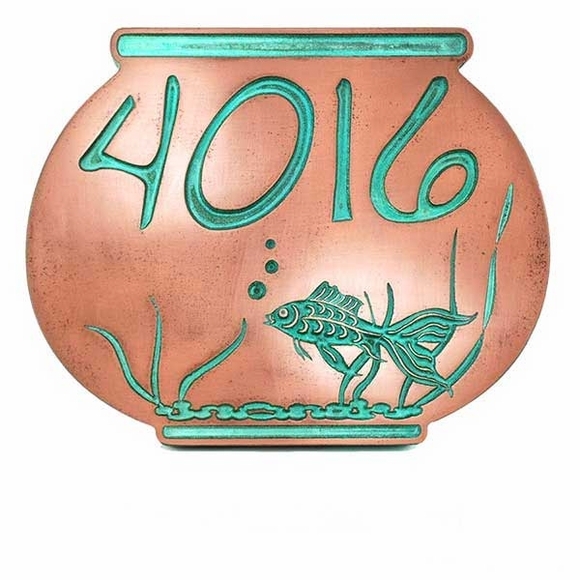 Address Plaque with Fish Theme - - personalized fish bowl shape house number sign with one swimming fish. Wall mount. 12"W x 9.5"H. Made in USA. Signs are an impressive 1" thick with lettering style shown in large image. Holds up to four numbers on one line. Seven upscale metal finishes: bronze patina, bronze verdi, copper patina, copper verdi (shown in large image), brass patina, silver nickel, and pewter. Bronze patina is black and dark golden brown that takes on copper highlights in the sunlight. Bronze verdi the verdi can range in the blues and greens due to a chemical reaction. Since the material is real metal not a paint, the initial color is not controllable and will change over time. Copper patina is more orange than red. It is not shiny. Copper verdi the verdi can range in the blues and greens due to a chemical reaction. Since the material is real metal not a paint, the initial color is not controllable and will change over time. Brass patina is black and light golden brown. Silver nickel silver with a slight golden tinge. Pewter has a slight blue overtone. Handcrafted using high density urethane (HDU) sign board, real metal coating, marine-grade clear coat. The result mimics the characteristics of true cast metal at an affordable price and without the extra weight. Easy to hang on any inside or outside wall; and won't warp, rot, or peel. Includes 3" deck screws with a Star-Drive head. Pre-drilled holes. The screw heads are metal coated to match your sign. Dimensions: 12"W x 9.5"H x 1". Made to order. Allow 4 to 5 weeks for delivery. Made in USA using American materials and labor.